A brochure (in Norwegian) has just become available via the website of Norsk Salmebok. "In this booklet you will find information about the hymn book and TV coverage. Here you can read what the Prime Minister's favorite hymn is - and you can test yourself in a Psalm quiz. NRK has had great success with their slow-TV broadcasts. Broadcasts such as Bergensbanen minute by minute and Hurtigruten minute by minute hit the audience in a way that few had thought beforehand. Now it is the Psalm Book's turn for minute by minute. Within 60 hours from Friday 28 November. 12:00 to Sunday 30 November, approximately at. 23.56, all the hymns in Norwegian Hymnal 2013 will be sung in numerical order from 1 to 899. Nearly 200 choirs and soloists will help in the transmission, which runs on NRK2 and nrk.no." 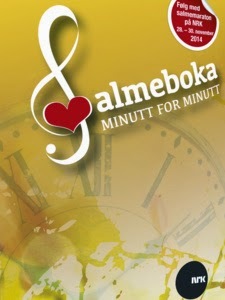 Visit the Norsk Salmebok Minutt for Minutt page here.